After a few minutes in Alec and Kit’s company, strangers have a tendency to turn to each other and nod excitedly. It’s not a secret language, I correct them. Anyone can join in – it’s just that, well, only Alec and Kit understand it. More knowing nods. Mother in denial. Alec and Kit, four, are bright, funny, and vocal but until a year ago had barely a handful of recognisable words between them. Instead of conventional English they deployed a series of grunts and actions to convey their everyday needs. Communication became an elaborate pantomime of songs, signs and codes with me, my husband and Harry, seven, cast as chief translators for a uniformly baffled outside world. Often we, too, were stumped, desperately trying to decode a sound while Alec or Kit roared it with increasing frustration. At times, the pantomime bordered on farce. Every time Alec or Kit wanted to say ‘spider’, they would sing “twinkle twinkle little star”, ‘big’ was “ooh”, ‘little’ was “aah”, “la la” meant either ‘yellow’, ‘wee’ or ‘over there’ or sometimes none of those things. Added to which they learnt a few Makaton signs so would suddenly pretend to milk a cow if they were thirsty (the sign for milk) or make the sign for cake if they were hungry. Naturally, it was sometimes hard to keep up and, for anyone outside our immediate family, impossible to follow. 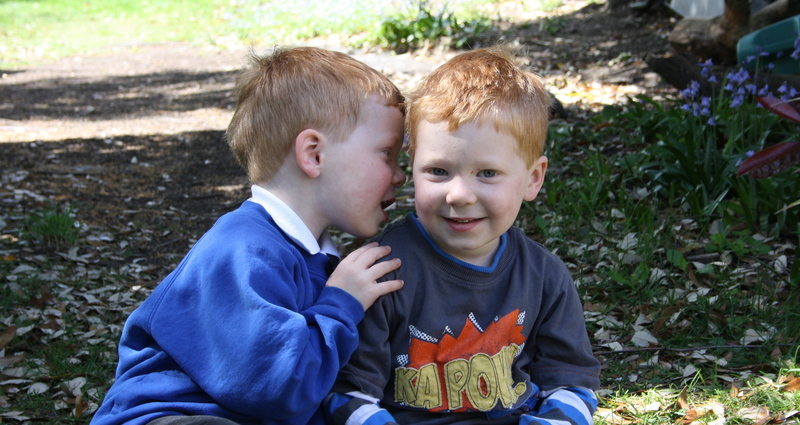 Speech delay among twins in general and identical ones in particular is not unusual. They spend more time in each other’s company than most siblings and often their natural baby babble becomes self-reinforcing when repeated back between themselves. It is estimated that 40 per cent of identical twins have some form of autonomous language in their early years. All of this I knew, even before Alec and Kit were born, plus I had the advantage of having a speech therapist in the family (my sister) and still here we were, with a communication crisis. The boys were progressing in so many ways and yet their language was so basic compared to their peers. I fretted constantly about the effect this was having on their overall development. The boys themselves seemed largely oblivious to the problem. They showed no interest in imitating language and stuck stubbornly to their version of words – often, frustratingly, converting other children and even adults to their way of saying things. Alec and Kit insisted on playing lengthy games of I-spy, even though they could only say one colour – “la la” again – and had to point to show the object they had in mind. They brought book after book to be read, yet never attempted to copy the sounds they so obviously enjoyed listening to. Their attitude seemed to be that this was our problem, not theirs. To compensate for their lack of vocal range they developed comically exaggerated facial expressions. A fully made up clown could not have looked sadder than Alec in full grump mode. Alec and Kit started to have speech therapy sessions two years ago. The initial therapy was largely aimed at me and my husband and gave us various techniques – such as describing scenes using simple language, not asking questions (which tend to elicit one word answers) and repeating back words as they should be said rather than correcting the child. The advice was to speak in sentences a word longer than the boys were capable of, which, at that stage, was two or three words. But the boys’ comprehension so far outstripped their language that this felt absurd, almost patronising. The boys’ hearing was tested and found to be fine but progress still seemed slow to non-existent. Starting part-time nursery at the age of three finally produced a break through. Their teachers – admirably unfazed by the challenge – reported that they were “tuning in” to Alec and Kit’s language. My heart sank. A mass conversion to “Aleckittish” seemed on the cards. However, by Christmas, their teachers were commenting on progress which we too were noticing at home. At last the boys wanted to use the same language as everyone else and were trying to copy words – a small but profound step. Gradually, they started to be able to say numbers and simple words such as “car” or “book”. One day after nursery the boys were upstairs playing. Kit brought me in a parcel. “Happy Birthday, Mummy,” he said. It was his first sentence. At their fourth birthday almost a year ago, it was hard not to compare Alec and Kit with their articulate, chatty peers. Despite all the progress they had made, they still did not use each other’s names – they had different words instead – and their sentences remained short and hard to understand. We kept reminding ourselves of how far they had come, but it was impossible to ignore how much work lay ahead too. Once words started forming there was even more of a battle to be heard at home. “Excuse me! Excuse me! Excuse me!” Alec would shout until all conversation around him stopped. When we asked him what he actually wanted to say he would sigh and say despondently: “I’ve begotten”. Now that the boys have started “cepshun” their language and confidence continues to improve. We still have roll-on-the-floor-why-can’t-you-understand-me moments and at the current rate of progress it may yet be a few years before Alec and Kit’s language is on a par with their peers but at last it feels like they will eventually catch up. Luckily the boys are better at dealing with it than I am. And with that they both sprinted off to build some Lego towers. Great piece of writing Jessica and so interesting. My boys aren’t twins but are only 15 months apart. Neither has language issues per se but when they’re being nice to each other they only use squeaks, grunts and the odd pat. Great collaboration over building a train track can sound like we have a litter of piglets in the house.